NOTES: Short run kit that will stretch your abilities. Royal Air Force doctrine between the wars, along with the United States Army Air Corps, was based on the notion that strategic bombing could win wars. Whereas the USAAC believed bombers could prevent the enemy from reaching US shores to begin with, the RAF believed that bombing would destroy the enemy's ability to wage a sustained conflict. Novel ideas, but doctrine only works when your enemy fights by your rules. The real problem however was the lack of training. Joint Planning Committee concluded in 1938 that it is difficult to train for something you've never done before and there would be no serious attempt to until 1941 when post-mission reconnaissance showed that fully half the ordnance dropped fell well off the mark. It was into this environment that the Battle was born. Designed and developed in a period when fabric covered biplanes were giving way to all-aluminum aircraft, the Battle was the first all metal monoplane bomber to enter service with the RAF. Powered by the Rolls Royce Merlin and carrying a 1000lb. bomb load it was a vast improvement over the aircraft it was to replace. But aircraft development in the late 30s and early 40s would shorten the Battle's usefulness as a front line aircraft. Operational for the first time in June 1937, the BF-109 would make her obsolete in September of 1939. The Battle would be a major player during the Blitzkrieg and would be called upon during the subsequent Battle of France. The now slow and underarmed Battle would be decimated rapidly. Her last front line service would be a series of night raids on 15 October 1940. The Wellington replaced the Battle and the Battle would fade to target towing and training duties. Of 2,185 built, five are known to exist. Four are in museums and are undergoing restorations and the fifth remains a wreck in Iceland. I've been wanting one of these since it first came out. I always liked the lines of the Battle and I thought it would look good sitting on the shelf next to a BoB Hurricane. However, when Classic Airframes released it I had other things to spend money on and when it became time to get one the best source was ebay and the collector prices were prohibitive. But patience is my ally and my friend and when I mentioned to Don Flynn that I was looking for one Terry McGrady overheard (how do you describe how that is done on a discussion group?) our conversation and offered me (one of, I hope) his. He even threw in a bunch of extra goodies like white metal seats, prop and Lewis gun along wit a set of Moskit exhaust pipes that I plan to save for a future Hurricane project. He also forgot one of the two bags of resin parts and was quick to make up for that, so, good trader kudos for Tel ;) The kit is typical of Classic Airframes: Two sprues of heavily injected styrene, two bags of nicely molded resin details and two vacuformed canopies and landing light lenses. So guess where building started? 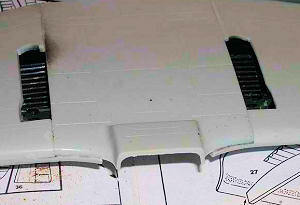 The resin cockpit bits were pretty nicely molded but thin and delicate and required particular care when removing the stubs. I have access to a nice bench top belt sander at work that the Metal Shop keeps fitted with fine emery paper and that's where cleaning up resin parts usually starts for me. A light touch took the stubs off nicely and cleanup with a nail file was a breeze. One of the redundant issues with Classic Airframes is cockpit fit. The people who do their resin seem to do a nice job on getting the scale dimensions right but this doesn't take into account that the styrene fuselage sides are not scale thickness. If you've never built a Classic Airframes kit, keep this in mind. As luck would have it however, this kit didn't have that issue. The cockpit is built in two tubs one front and one rear-and they both fit nicely. With frequent dry fitting the fuselage fit together nicely. The only real issue I had was the wing. It is engineered into five pieces; two upper and two lower halves with a center section for the bottom. And it is not my style to glue wing parts to the fuselage. I prefer a wing assembly, only because I like to clean up wings separate from the fuselage. With this one I tack glued the parts into place, sanded to fit, dry fitted them, sanded some more. Eventually I had the wing assembly together. The arc on the upper halves didn't line up with the fuselage fairings however. I corrected this by fitting pieces of sprue inside the wing at the fairing until it lined up and then glued them into place. Worked a treat, as Tel might say. From there on assembly was pretty much downhill. Nothing atypical here. RAF Bombers were Dark Green and Dark Earth over black. I used Floquil Engine Black for the bottom and Model Master for the rest-including the interior green for the cockpit, I might add. For painting the top, I scaled up the decal instructions at work, put them under a piece of glass in a picture frame, laid a piece of frisket paper on the glass and cut it up on the lines. The real one likely had a slight bit of a soft line between camouflage colors but in 1/48 scale I find it hardly noticeable. I bashed the kit decals to represent one of the 12 Squadron Battles that participated in the attack on the bridges over the Albert Canal on 12 May 1940. The kit decals were very nice and gave me no issues at all. Final assembly consisted of fitting landing gear and the canopy. The landing gear was a bit troublesome as the instructions aren't very clear on how it fits together. Per Tom Cleaver's recommendation, I studied the pics of the Battle on display at Hendon until I figured out how the gear actually works. My bane however is vacuformed canopies. Ooh, I hate them. They're beautiful once they're done but I use up all the language I learned in Boot Camp getting them done. 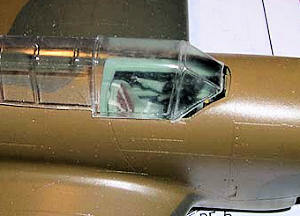 To spare myself a whole lot of trouble I just opened the front canopy. It was also nice in that the casual observer wouldn't notice that I sanded the cockpit opening too long when I cleaned up the edges. So I have my Battle. Not a show winner by any means but I知 happy to have one. And it did look good on display at work, next to a BoB Hurricane I built a year earlier. 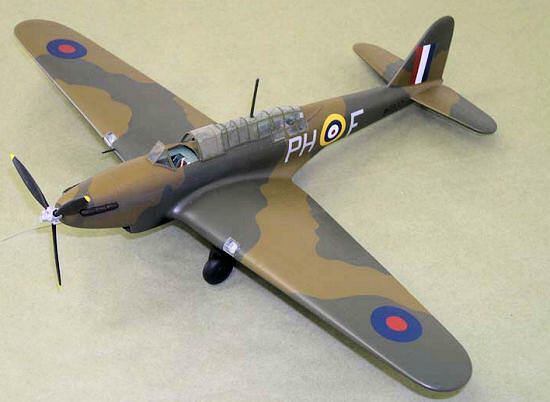 I think if I had a regret about this build, it would be the fact that the RAF didn't carry the really big fin flashes on the tail, which seems to be unique to Battles flown by Polish squadrons. Which means I have an excuse to build another J If you have built a couple of limited run kits, I recommend this one to challenge you a bit further. The remnants of a book on bombers that I had as a kid that was printed in the UK that I have long ago lost the covers and several pages to, so I don't know what the title or publisher is; Wikipedia, good ol Google, Tom Cleaver's build.